Young Philanthropists Society – United Way of Central Alabama, Inc. 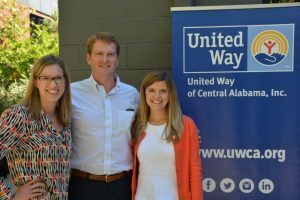 The United Way Young Philanthropists Society (YPS) is a group of young professionals who live and work in Central Alabama and are creating their legacy through United Way with an annual gift of $1,000 of more. If you are looking for a way to get involved in our community, consider joining YPS. Opportunities to learn more about community needs and the work being done through lunchtime tours of partner agencies and chances to hear from experts in the field. Chances to roll up your sleeves and take part in hands-on volunteer projects throughout the year. Invitations to network with like-minded peers as well as corporate and community leadership. Company and community recognition through your employer’s United Way campaign. Members from United Way of Central Alabama’s Young Philanthropist Society and Tocqueville Society gathered at the brand new Blueprint on 3rd for A Sneak Peek for a Cause. Restauranteur Dean Robb and Executive Chef James Huckaby opened the doors of their new American brasserie restaurant, B3, one night before their grand opening exclusively for YPS and Tocqueville members to taste their cuisine. Robb and Huckaby wanted to host this free event to not only promote United Way’s programs but also to support the neighborhood since both B3 and UWCA’s locations are in Avondale. Back Forty Beer Company was the place to be the night of September 24. 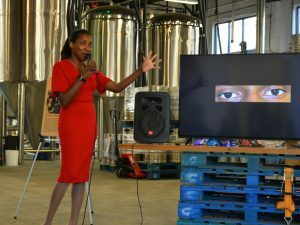 United Way of Central Alabama’s Young Philanthropists Society hosted their annual Happy Hour Kickoff at the new brewery. 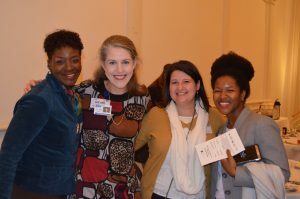 YPS is a group of young professionals who live and work in Central Alabama and are creating their legacy through donating annually and volunteering with United Way. Young Philanthropists Society Co-Chair, Jemison Jones of O’Neal Steel, started off the night by welcoming everyone to the event and introducing his father, Bill Jones, who served as the keynote speaker. Bill told his story of growing up in Birmingham and all the personalities the city is known for such as healthcare, diversity in race and industries, and good food. 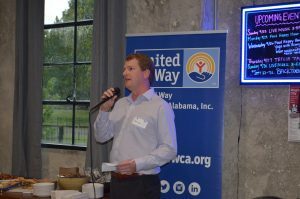 Bill said, “Birmingham is known for so many different things, but best known for its generosity.” He also discussed how United Way of Central Alabama is a top 10 United Way and top 5 in the number of members in the Tocqueville Society. 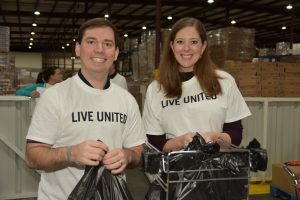 Volunteers from United Way’s Young Philanthropist Society (YPS) and Tocqueville Society joined together at the Community Food Bank of Central Alabama, a United Way partner agency, to help combat the food crisis in their community. More than 30 volunteers packed food for the Food Bank’s Weekender Backpack program and the Mobile Pantry. The Weekender Backpack program provides children with a five-pound bag of healthy food to take home over the weekend and on holidays, when they might otherwise go without a meal. The Mobile Pantry program provides a wide selection of food to areas commonly referred to as “food deserts,” which lack easy access to nutritious and fresh food. Collaborating resources is the key to preventing and better serving domestic violence victims. October is Domestic Violence month, and members of United Way’s Young Philanthropists Society attended a panel discussion on the topic, featuring staff from local agencies that offer resources to survivors of domestic violence and sexual abuse or assault. United Way of Central Alabama’s Young Philanthropists’ Society met for an update on this year’s campaign this Monday, September 18th. 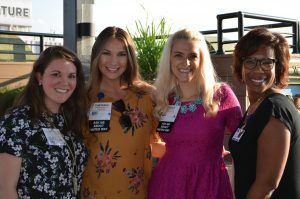 Held at the Elyton Hotel’s Moonshine rooftop bar, this gathering of young professionals featured fun and fellowship to promote membership and donations. One of the goals of United Way’s Young Philanthropists Society is to foster that crucial generational support. 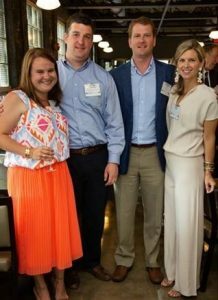 YPS is a group of young professionals in Central Alabama who give at a Leadership level of $1,000 or more to United Way. Many YPS members and all three of its co-chairs have a long and proud family history of philanthropic work and contributing to the work of United Way. 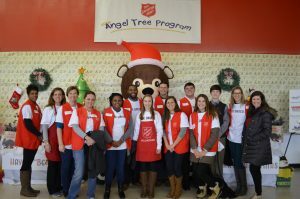 Members of United Way’s Young Philanthropists Society (YPS) joined with the Salvation Army to help many children’s Christmas wishes come true by distributing Angel Tree gifts to families. YPS members hear from Donna Dukes, executive director of Maranathan Academy. Her academy transforms lives by resuscitating broken hearts and renewing shattered dreams and unfulfilled promises of critically at-risk-youth and adults in and around the city of Birmingham. Members of the Young Philanthropists and Tocqueville Societies volunteered with the Community Food Bank of Central Alabama assembling bags for their Weekender Backpack program.